Buffet Breakfast For Rs. 49 Only At Jiva is an event that took place between 27-Mar-2006 and 30-Jun-2007 in Hyderabad. Get rid of rushed weekday mornings. Bread toasted to charcoal and a piddly cup of milk. Ohri's Jiva has set the breakfast table for you. All you gotta do is reach in time. There is the usual idli, vada and dosa combination. 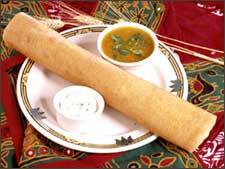 If you want a heavy breakfast you can opt for naram garam paranthas or pooris and sabzi. Or you can go for a truly English breakfast. Cornflakes, milk and muffins, with tea, coffee or fresh fruit juice. Please contact 98667-78047/98667-78048 for further details. fullhyd.com has 700,000+ monthly visits. Tell Hyderabad what you feel about Buffet Breakfast For Rs. 49 Only At Jiva!